Neal Esterly at Fraser Yachts in San Diego asks me to spread the word that the bank owning the 33.8m sportsfishing motor yacht Crystal really wants her gone and has authorised a $400,000 price drop. Built in 1987 by Deep Sea Marine, Crystal was refitted in 2001 and has flexible accommodation for 12 guests in five staterooms and seven crew in four cabins. This superyacht has excellent fishing, diving and cruising capabilities and a 4,500 nautical mile range while offering a luxuriously comfortable interior. 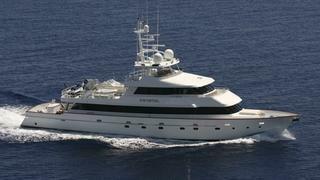 She has been a favourite of many captains and crew on the US West and East coasts. Previously listed at $2.5 million, Crystal is now down to $2.1 million.